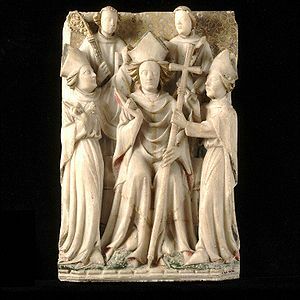 Beginning when he was 10, Becket was sent as a student to Merton Priory in England and later attended a grammar school in London, perhaps the one at St Paul's Cathedral. He did not study any subjects beyond the trivium and quadrivium at these schools. Later, he spent about a year in Paris around age 20. He did not, however, study canon or civil law at this time and his Latin skill always remained somewhat rudimentary. Some time after Becket began his schooling, Gilbert Beket suffered financial reverses, and the younger Becket was forced to earn a living as a clerk. 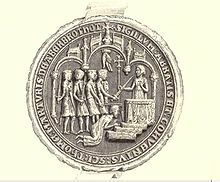 Gilbert first secured a place for his son in the business of a relative—Osbert Huitdeniers—and then later Becket acquired a position in the household of Theobald of Bec, by now the Archbishop of Canterbury. Becket was ordained a priest on June 2, 1162 at Canterbury, and on June 3, 1162 was consecrated as archbishop by Henry of Blois, the Bishop of Winchester and the other suffragan bishops of Canterbury. 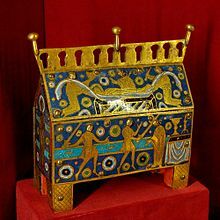 Becket's assassination and funeral, from a French enamelled chasse made about 1190–1200, one of about 52 surviving examples. On 29 December 1170, they arrived at Canterbury. According to accounts left by the monk, Gervase of Canterbury and eyewitness, Edward Grim, they placed their weapons under a tree outside the cathedral and hid their mail armour under cloaks before entering to challenge Becket. The knights informed Becket he was to go to Winchester to give an account of his actions, but Becket refused. It was not until Becket refused their demands to submit to the king's will that they retrieved their weapons and rushed back inside for the killing. Becket, meanwhile, proceeded to the main hall for vespers. The other monks tried to bolt themselves in for safety, but Becket said to them, "It is not right to make a fortress out of the house of prayer!," ordering them to reopen the doors. 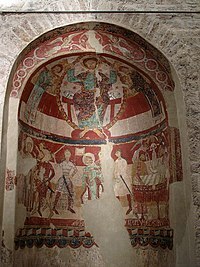 The four knights, wielding drawn swords, ran into the room saying "Where is Thomas Becket, traitor to the king to the king and country!" The knights found Becket in a spot near a door to the monastic cloister, the stairs into the crypt, and the stairs leading up into the quire of the cathedral, where the monks were chanting vespers. Upon seeing them, Becket said, "I am no traitor and I am ready to die." One knight grabbed him and tried to pull him outside, but Becket grabbed onto a pillar and bowed his head to make peace with God. 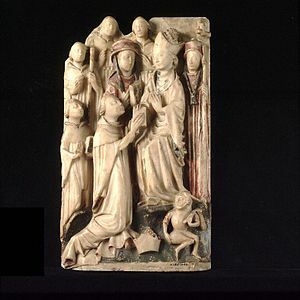 ^ "V&A plaque", with latest count; Binski, 225, with a catalogue entry on one in the Burrell Collection in Glasgow. ^ Drake, Gavin (23 May 2016). 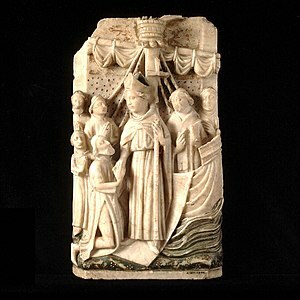 "Becket's bones return to Canterbury Cathedral". anglicannews.org. Retrieved 23 May 2016. ^ Child, Harold Hannyngton (1912). "Irving, Henry" . Dictionary of National Biography (2nd supplement). London: Smith, Elder & Co.